Follow these simple instructions to get your little boy or young man fitted in a suit or tuxedo. You only need a few things to get started. A boy (son or grandson), if he's not available you can always substitute with the same size of clothing he currently wears. Last thing you need which is very important is a measurement tape. If you don't have any access to a measurement tape, please check this neat little trick. (http://www.wikihow.com/Take-Clothing-Measurements-Without-Measuring-Tape) It teaches you how to measure without using a measurement tape. Now you know what you need lets get started! 1. Sleeve Length: Take the measurement tape and start at the shoulder blade where you should feel the bone stick out. Measure all the way down to the wrist and stop a few inches past the wrist. If you are using a piece of shirt it should stop at the cuff. 2. Waistline: This should be pretty simple if your know your son's waistline. Most of our suits come with a rubber elastic waistband in the back of the trouser. It has some room to expand to a bigger size if needed. To measure this on a boy all you need to do is take the measuring tape and measure around his waistline. 3. Chest: Take the measuring tape and wrap it around his chest. There are two methods for doing this. First one is underneath his arms pits. The other method is called the overarm. Where you would include measuring the arms. 4. Trousers/Pants Length: Use the measuring tape and start at the waistline not the hip bone then measure down to the ankle. Same method would be applied when measuring on a pair of pants. 5. Shoulder Seam to Shoulder Seam: Start at the top sleeve and measure straight across. Remember in step 1 I mentioned the shoulder blade where the bone sticks out? That would be the same position you start at to measure shoulder to shoulder. 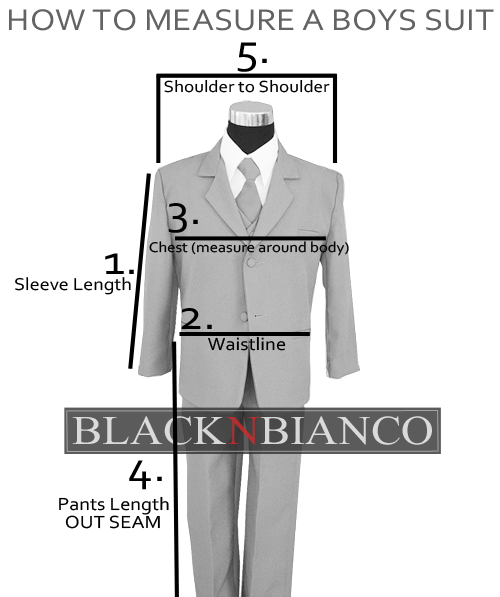 If you follow these simple steps you will be assured you have the perfect suit or tuxedo for your little guy.